Vodafone has introduced its first LTE Advanced Router to the public router at Cebit in Hanover. It is the Vodafone B4000 router. Vodafone stays true to the name. 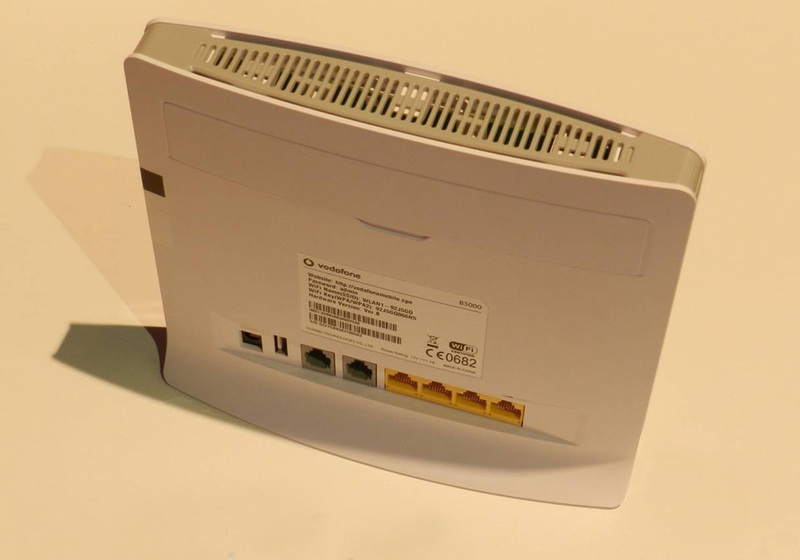 The Vodafone B4000 comes from factory model Huawei E5186 LTE cat6 Router. There were already the Vodafone router B1000, B2000, B3000 and now the latest router model the B4000 comes out. The new Vodafone router is the first CAT6 LTE Advanced router with a maximum possible download speed of up to 300 Mbit/s. Category 6 LTE is the same as LTE -Advanced. The Vodafone B4000 router is of course again manufactured by Huawei and is identical with the Huawei E5186s-22. If you want a fast LTE access, the Vodafone B4000 should be necessary to buy. However, one has to be patient until the summer of 2014, then the B4000 will be available. From the beginning of 2014, Vodafone has launched a new LTE Router Vodafone B3000 on the market, the successor to the B2000 LTE router, which had been tested last year. The biggest new feature is the improved speed of 150 megabits per second (LTE Category 4), which function is not available in the Vodafone B2000. I could look at the Vodafone B3000 router at CeBIT 2014 in more detail; you will find some photos of the B3000 in this article. The experience regarding reception quality and data rates based on the Huawei B593 4G Router, as the two devices are almost identical. The Vodafone B3000 LTE router is manufactured by Huawei and the corresponding model is B593s-22. 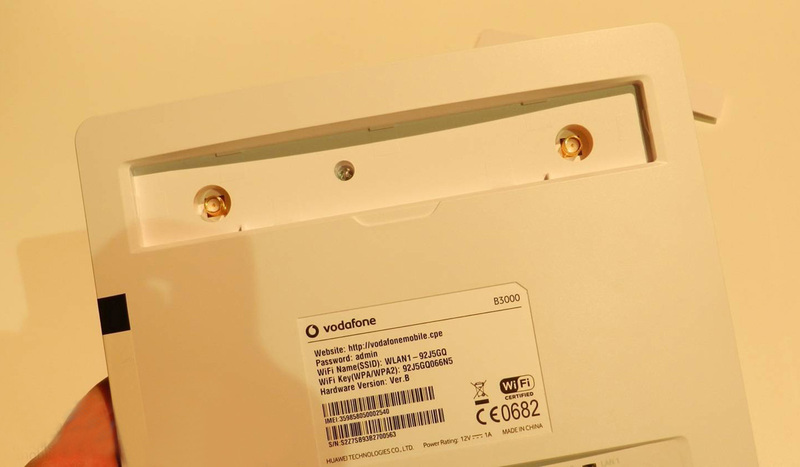 As already talking about, extensive branding is used on the Vodafone B2000 and Vodafone B1000, which could be also clearly recognized on the B3000 as Vodafone device. For the user that has really no disadvantages, the functions are more or less unchanged. 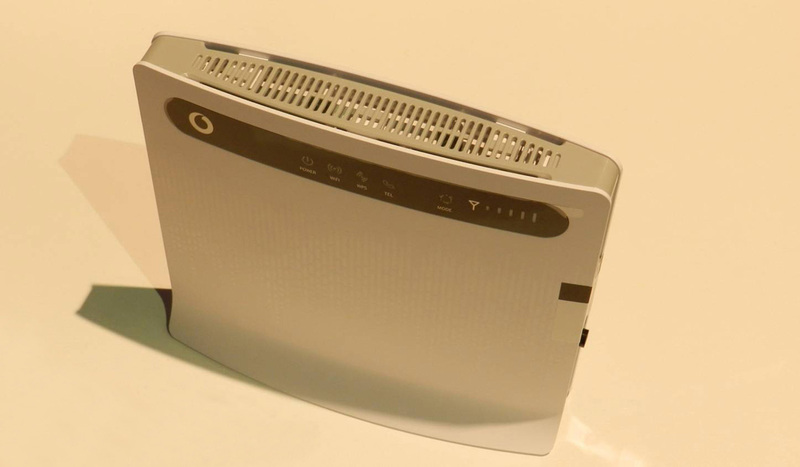 The Vodafone B3000 comes in a fancy box in the new Vodafone-design and the router can be found with a power cable and a short Ethernet cable. In addition, of course, there is still a quick-start guide and a safety instruction included. On the back of Vodafone B3000 you will find various connections: there are 4 LAN ports, each operating at a maximum of 100 Mbit/s. In addition, there are two RJ-11 ports for analog phones and a USB 2.0 port. On the right side, a separate power switch is still attached to the left two buttons for WLAN / WPS circuit. The two telephone connections are available but only for VoIP telephone; telephone support through the mobile network (CS or VoLTE) is not available in the B3000 LTE Router. Vodafone B3000’s internal WLAN module only works on 2.4 GHz and supports 802.11 b/g/n. The speed is depending on the distance to the router at about 90 Mbit/s, so that the full speed of LTE cannot be achieved here as well. The range of the wireless network is certainly absolutely sufficient for most users, on request, up to four separate SSIDs (network name) will be awarded. With support for LTE Category 4, data rates up to 150 Mbit/s downlink and 50 Mbit/s in the uplink are theoretically possible with the Vodafone B3000. However, Vodafone is providing these data rates over LTE2600 currently available only in cities and at sites with very high data volumes, on widespread LTE800, Vodafone has so far only about 50 – 60 MBit/s in downlink. In general, the B3000 can also achieve these data rates, and allows quick and easy browsing, but a little “design flaw”. Unfortunately, there is neither over the WLAN module nor the LAN ports, the maximum speed of 150 Mbit/s is available. Of course, this is hardly relevant to a user. The reception quality is good when measured. Even in regions with weak reception, good data rates are possible. Since the Vodafone B3000 router supported (LTE800, LTE1800 and LTE2600) all frequency bands used in Germany, the device is also quite future proof. Upon request, the receiving means of external antenna can be improved. 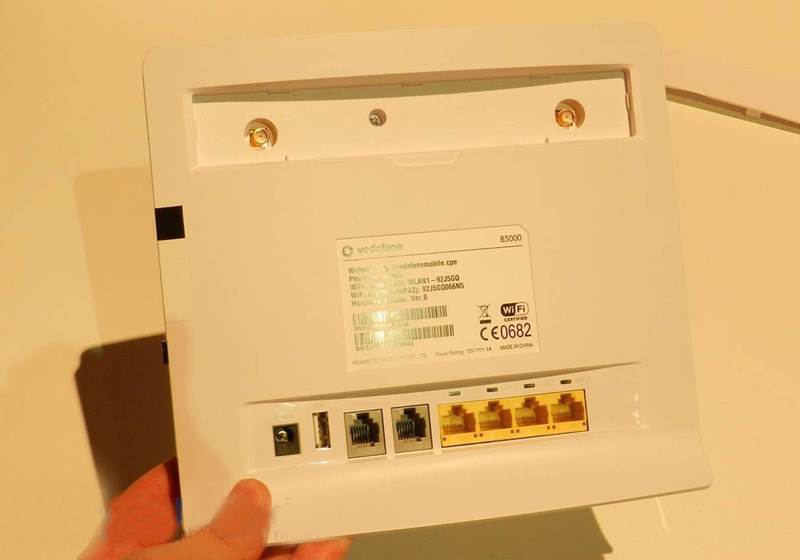 For this purpose, two SMA connectors are located under a cover on the back of the router. The Vodafone B3000 LTE is undoubtedly a good router, with which most users are likely very satisfied. However, there are also some weaknesses: the LAN ports only work with a maximum of 100 Mbit/s and the internet is not very fast. The consequence: it is impossible, the theoretical maximum speed of 150 Mbit/s to use them. If only for this reason, it is difficult to understand why Vodafone has brought the B3000 LTE Router at all on the market, while the Vodafone B4000 is already a much more powerful successor waiting in the wings. If you appreciate Gigabit LAN and WLAN radio technology, future-proof, should wait a little longer for the sequel, we will see Vodafone B4000 Later. .